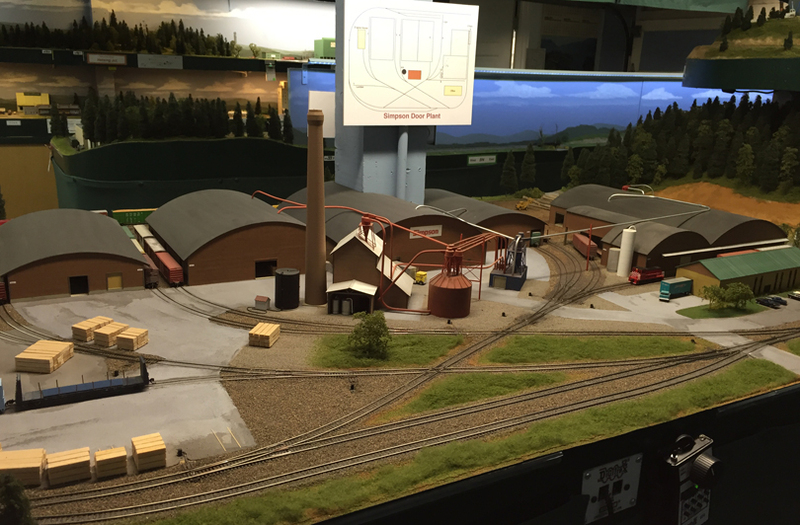 One of the industries at my layout town of Ballard has been a machine shop, ever since the era when the layout was in Pittsburgh. In the map on my post about the old layout (it’s at this link: http://modelingthesp.blogspot.com/2012/03/survival-from-my-old-layout.html ), this industry was no. 24 on the map, and was called Santa Barbara Tool & Implement (the layout was then set in Santa Barbara County). In the late days of that layout, I changed the name to Santa Barbara Tool & Machine, to get more of a machine shop name. 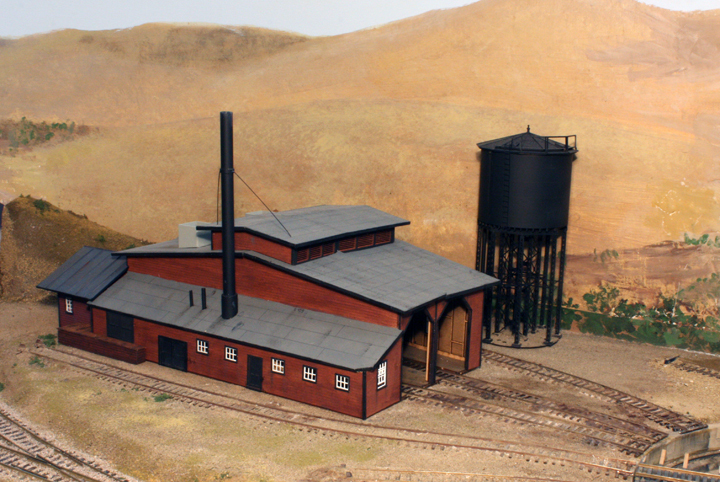 The building used on the Pittsburgh layout was a partly assembled Tru-Scale kit of the late 1940s, which I had purchased along with its original kit box. 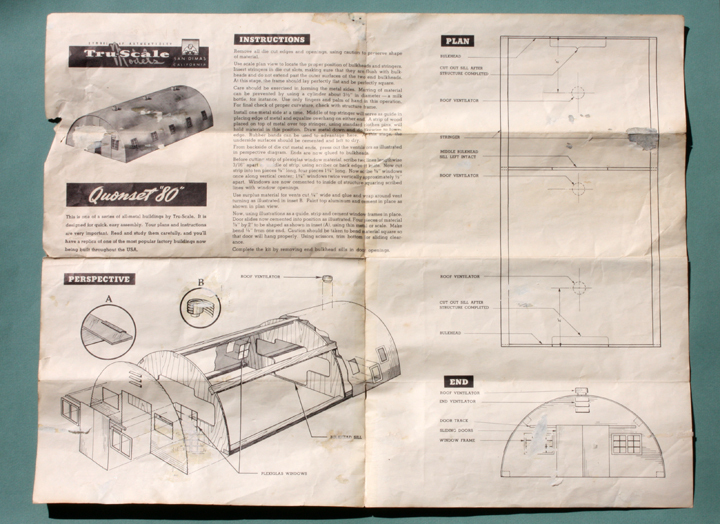 It was a Quonset hut, 40 by 80 feet in footprint. Below I show the kit box, proclaiming the “all metal” construction of the model, though in fact the interior bulkheads and stringers are pinewood strips, 1/4-inch square. 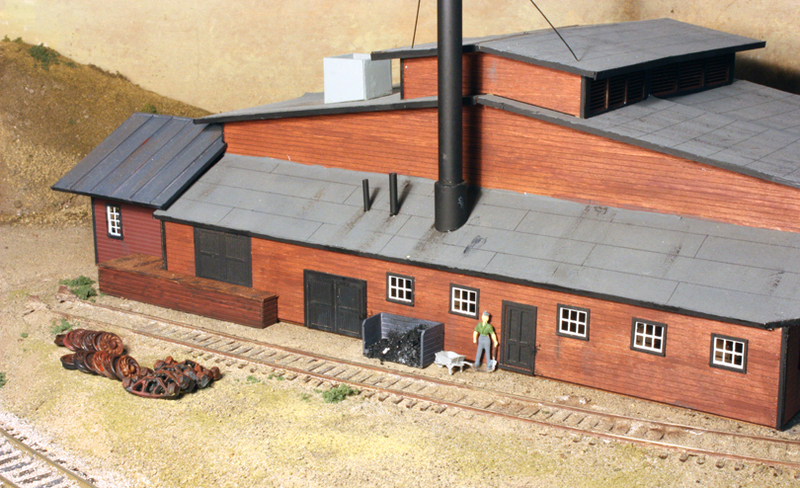 In the 1950s, there were plenty of Quonset hut structures around the U.S., used for a wide variety of manufacturing and warehousing purposes, so I liked the idea of having one on my layout. I had long intended to complete kit construction, along with maybe upgrading some details, like the rather poor kit windows, but had never done so. Now, with a chance to add this industry to the town of Ballard, I decided to work on the kit. I am now calling this industry “Santa Maria Tool & Machine” since my current layout locale is much nearer Santa Maria than Santa Barbara. My first step was to shorten the building. I don’t have space for the full 80-foot length, so decided to cut it down. After all, prototype Quonset huts were built in a range of widths and lengths, and were essentially modular in 4-foot units (the rib spacing). My choice was to retain three side windows instead of the original five, and keep them centered in the side view. This meant a 48-foot length, which is what’s shown in the photo below. The other way to look at the length is that there are about 16 scale feet per side window, and I have cut down from 5 to 3 windows, thus going from 80 scale feet to 48 feet. The directions have the comment, “best results with DuPont Cement,” though I don’t know what that was. The adhesive used, DuPont or otherwise, today had pulled away from the joints, and looks a little like ancient Walthers Goo or equivalent. I simply added a generous amount of canopy glue into the joint and re-clamped, using clothes pins (most reversed), This not only stiffens the structure but straightens the somewhat soft aluminum skin. I will continue this process, joint by joint, until the entire structure is solidly glued together.I also have a plan to make simple windows, which don’t have to be too involved because this structure will be located a ways back from the edge of the layout, thus not seen up close. I am pleased to be working on this building, as it has been catching my eye for years and making me want to get into fixing it up. Now it’s under way, and I’ll report on progress in a future post. As part of my engine service terminal at Shumala, I built a roundhouse from a Banta Modelworks kit, and added a small machine shop at the rear. This was described in an earlier post (at: http://modelingthesp.blogspot.com/2014/01/shumala-roundhouse-part-3-machine-shop.html ). In the conclusion to my series of posts about building the Banta kit, I showed an overhead view of the new roundhouse in place, with a stand-in shop track simply lying in the approximate correct location (that post is at this link: http://modelingthesp.blogspot.com/2014/02/a-roundhouse-for-shumala-part-5.html ). Over time, with the shop track still not spiked down nor powered, I have had to omit from operations any waybills for cars delivered to or picked up from the shop, and so the shop track has remained on the layout “punch list” for all that time. While doing some other electrical work on the layout (as I have described previously at: http://modelingthesp.blogspot.com/2016/03/changing-throttle-connections.html ), I simply gravitated to this additional task, and got the track spiked down, and feeders dropped to power it. 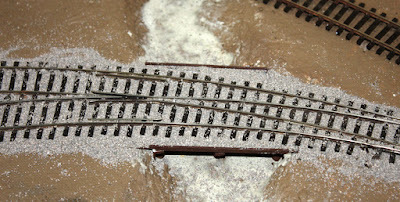 With the track in place, I added dirt “ballast” to fit with what one sees in SP prototype shots around shops and yards. This “dirt” is real dirt, screened to a small size. I used my regular method to apply this, mist-wetting the material first with “wet water” (a drop of dishwashing liquid in my spray mister), then using diluted matte medium through an eye dropper to fix it in place. 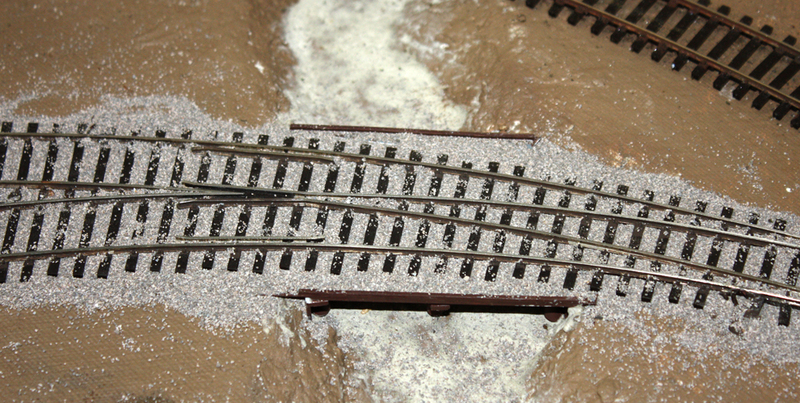 Here is the area with the track completed and ballasted. Setting this track also allowed me to plan the space for the coal pile needed alongside the roundhouse, as the boiler room would consume that fuel. (In fact, in the early 1950s, when I model, SP continued to supply coal for many domestic fuel uses, from heating of section houses, cabooses and depots, to cooking in living quarters of depots or section housing, and boilers such as the steam supply for the roundhouse, or for sand house sand dryers.) I mentioned this in a prior blog post about my gondola fleet (see it at: http://modelingthesp.blogspot.com/2011/04/choosing-model-car-fleet-8-gondolas.html ). Though photos are not plentiful, it is evident that SP often used a three-sided, open-top storage area for domestic coal, so I decided to do the same. I measured that it could be 4 scale feet deep, so proceeded with that as the critical dimension. I just used Evergreen scribed styrene sheet, with interior corner posts to hold it together, since those posts will be hidden by the coal pile. I also decided to add a wheel track. These were commonly seen around roundhouses, and could by located anywhere that was convenient. Workmen could roll the wheelsets, or even complete trucks, on and off the turntable, to move them as needed between a wheel track, roundhouse shop, and the repair track area. The photo below shows two arch-bar trucks being moved by workmen, at the Merchants Despatch shop in East Rochester, New York (detail of photo from Library of Congress, Prints and Photographs Division). You can click to enlarge. My wheel track then was set up to come off from the turntable, as seen at lower right (the coal storage is not in place in this photo). Tracks like this varied from quite short to car length. I will have more to say about trucks and wheelsets on this track in a future post. Lastly, I added some coal to the coal box and experimented with placement, near the double door leading into the boiler room of the roundhouse, as you see below. I’ve posed a workman with a shovel, and a wheelbarrow, next to the coal box. Rather than show the coal pile at maximum, it seemed more realistic to show it partly depleted, to reflect ongoing use in the boiler. Also visible at left are stacks of car wheels, and truck sideframes, about which, more later. Finishing this side of the roundhouse area, and particularly setting up another switching destination at Shumala, has been fun and will definitely enhance this part of the layout. The title here refers to an operating weekend in the Seattle-Tacoma area, known as Soundrail, that is convened in alternate (even-numbered) years. It involves a number of layouts and 60 some participants, from outside the area, many of them invited. This year it was held on March 17–19, and it was the first year I have attended. Although there were 24 layouts in all, I operated (as did almost everyone) on only three, and visited a few more on Thursday night’s open houses. 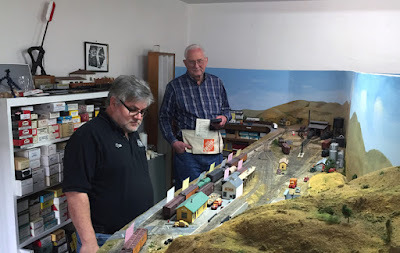 The first day I was at Brian Ferris’s HO scale Port Townsend Southern in Olympia. Though not a large layout, I really liked how well done it is, and our crew of eight was busy all day. Many of his scenery features are very nicely accomplished. The photo below shows Glen Presley, with whom I ran a local freight at one point, though in this photo he is switching the yard at Chambers Point. Glen was one of eight Canadians at the event. One of the layout visits was to Jim Younkins’ N scale Mud Bay & Southern, which has just exceptional scenery. 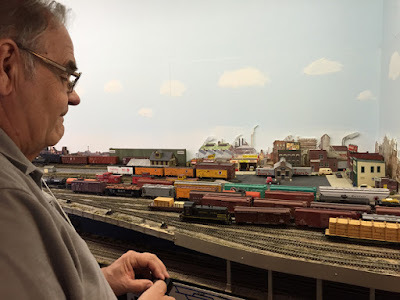 Jim has taken advantage of the opportunity in N scale to have industries of more realistic size than is practical in larger scales, and many of his model industries were really excellent. I will show one example, his Simpson Door Plant, obviously with plenty of switching and doubtless calling for careful planning to switch efficiently. Quite a layout. Bill Sornsin’s large and very ambitious HO Cascade Division (Great Northern) was my second layout for operation, and believe me, it is truly impressive, even in its early state of development. The photo below shows Mark Schutzer operating a local switch job at Holgate Street (Seattle) on the upper deck, with the “south staging” (Portland, etc.) on the lower deck. 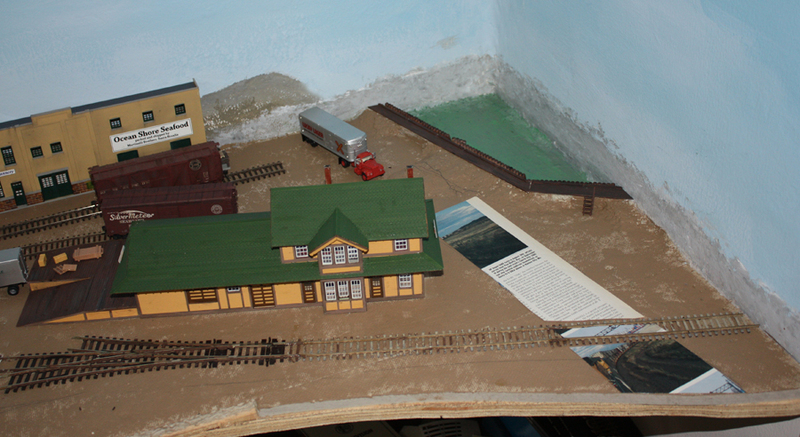 My third layout was Roger Nulton’s Monon Route in S scale. The scenery is truly excellent and the layout ran very smoothly. Shown here are Ray DeBlieck, left, uncoupling a car to set out, and Scott Calvert. The fall foliage is very realistically rendered, unlike so many layouts which just have trees of crimson and fluorescent orange. Anyone who has lived in parts of the country which do have that foliage in the fall can recognize how accurately Roger has modeled it. I was quite impressed with not only the overall scenic effect, but also with many of the scenic details that Roger has done. I will just show one example, a stock pen with one of those “often seen but seldom modeled” features, the worn spots in the grass leading to the pen. It’s shown below. Last, I have to mention one of the most welcoming signs a traveler like me can see, which I photographed on the way to departure at Sea-Tac airport. Turned out the sign was accurate, too, and our travel group took advantage of it to grab a quick dinner. This year’s Soundrail was a great experience, and I enjoyed all parts of it. But the main reason I have described what’s involved is to promote the idea of attending one of these events if you can. As the saying goes, if you get the opportunity to attend an operating weekend, run, don’t walk. From the beginning of controlling my layout with DCC, I chose North Coast Engineering (NCE). My starting system used an NCE Power Cab as the basis. This is a tethered throttle, and more throttles can be added, though the basic power level of 2 to 2.5 amps remains. I later added one additional throttle, and thus have mostly used two throttles, one for each side of the layout. The performance and convenience of this system has been excellent. To the right you can see strings of cars on the staging pull-out table, and in the face of it, the drawer used for storing open-car loads (a project described earlier, at: http://modelingthesp.blogspot.com/2015/04/a-drawer-to-store-open-car-loads.html ). Just recently I decided it was time to go wireless. So many layouts on which a person may operate now have radio, that it seemed like time to change. To do this, I replaced my Power Cab foundation with a regular NCE command station and a radio antenna, and then I also needed to convert my throttles from plug-in to radio. This is fairly simple to do, and you can have NCE do the throttle conversion for you. I also decided to divide my layout into two power districts. It is not a particularly big layout, and this division is not needed for power distribution, but it does separate the two districts so that a short in one does not affect the other. I used the NCE EB3 circuit breaker for this. Of course, to do this division I had to crawl around under the layout and decipher my existing feeders and terminal strips. I should hasten to say that I do label all feeders underneath the layout, by writing their designation next to them with a Sharpie, right where they emerge under the plywood or whatever the local sub-base is. I also have a long-continuing “layout notebook,” in the form of a three-ring binder, in which I try to record specifics of all new wiring. I showed a page of this notebook in a previous post (see it at: http://modelingthesp.blogspot.com/2012/08/a-modeling-journal.html ), though that post really was primarily about my modeling journal, not the notebook. Here’s another notebook page, with a lot of feeders identified. When things get complex, color coding comes into play. This kind of information is vital when a job like this one, to rearrange the layout power districts, has to be done, so I’m glad this all these records have been maintained over the years. I now have my original throttles converted from plug-in to radio. I appreciate Ray DeBlieck’s help in getting this done. The photo below shows one of the first trains moved with a newly cordless throttle. At least for now, the cords and fascia plugs remain in place for when they might be needed, but engineers now can walk wherever they need to go around the layout. 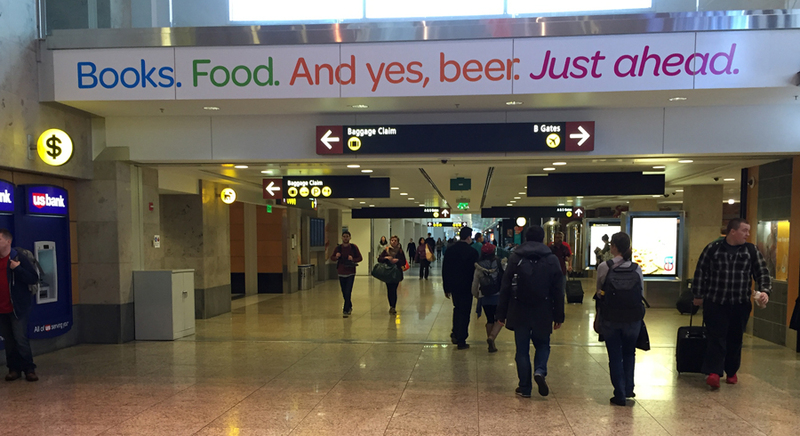 Nice change for the better, and I enjoy the freedom as much as visitors will. 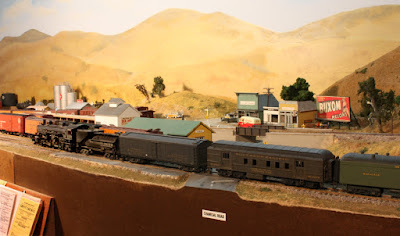 In a couple of prior posts, I described progress on my creation of Oso Flaco Creek to act in part as a scene divider between my towns of Ballard and Santa Rosalia, as well as a scenic element (the most recent of these posts is at this link: http://modelingthesp.blogspot.com/2015/03/modeling-oso-flaco-creek-part-2.html ). My branch line crosses this creek to reach Santa Rosalia, and I decided the bridge should be an SP pile trestle of standard design. I explained the components of the trestle design in a previous post, and also showed my construction method (you can see it at: http://modelingthesp.blogspot.com/2015/04/building-sp-pile-trestle.html ). I combined two steps in installing the pile bents and bulkheads of the trestle, namely to add a thin layer of paper-mache to the bed of the creek, which needs a little texture, at the same time as the trestle was installed. I mixed a water-base paint (a color called “Almond”) into the paper-mache to soften its gray color. This way, the trestle parts were glued down with the paper-mache and were also embedded in it at ground level. In the photo below, you can see the two pile bulkheads and the bent of piles at the creek center, and behind the trestle site, the creek disappearing toward the backdrop, as I had begun in the second creek post (cited at the top of this post). To keep the trackwork and surrounding ground level, I chose to use a thin styrene sheet to make a track base, with styrene strip along the edges crossing the creek to simulate the beams visible at the edge of this kind of bridge (see my first pile trestle post, cited at the end of the first paragraph above, for a drawing). As shown in that first post, I originally planned to use 0.020-inch sheet under the track, and even showed a piece of such sheet in place, but decided to use something thinner still, namely 0.005-inch sheet. This is structurally all right, because the sheet really will only act to hold the ballast on this kind of ballasted-deck trestle. The styrene sheet was set atop the bent caps and was glued in place, and the trackage above it installed. The sheet being transparent, you can see the support structure beneath, though of course this will disappear when the trestle is ballasted. From more of a side angle, you can see the piles underneath the transverse caps that support the bridge. Obviously the creek bed and banks remain to be scenicked, but with this bridge complete, I can proceed with those tasks without worrying about exactly where the track is located. Completing this bridge has been part of the process of bringing the end of the branch, at Santa Rosalia, into scenic contact with the adjoining scenic area, the town of Ballard. I look forward to more fun developing scenery elements in this area. 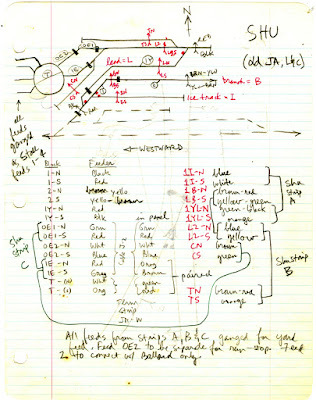 I have posted several descriptions of Richard’s open-top car loads, for example this recent one (see it at: http://modelingthesp.blogspot.com/2015/09/more-richard-hendrickson-open-car-loads.html ). I also posted a set of photos of his interesting and varied lumber loads (that post is at: http://modelingthesp.blogspot.com/2015/06/richard-hendricksons-lumber-loads.html ). In this post, I want to present a few more of his load ideas. Nearly all his loads were glued into or onto the freight cars. This permitted some complex modeling of tie-down details and other arrangements for some flatcar loads. Personally, I forego those details and make nearly all my loads removable, because the car normally will need to move both to and from a destination on the layout. 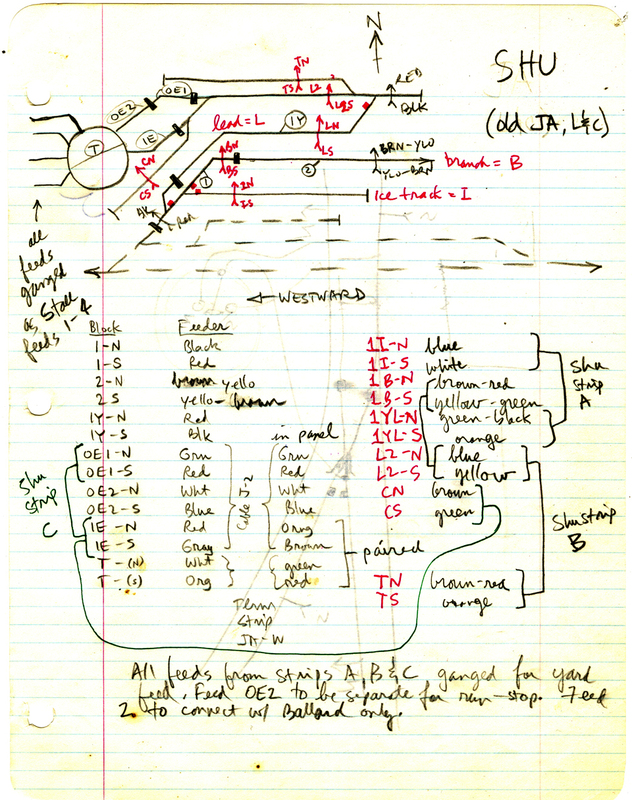 But Richard’s layout plan was really a kind of “railfan” arrangement, with a fairly small diorama having essentially no switching locations on it, supported by a lot of staging. That way, the observer could witness multiple trains passing through the diorama in a single session, and of course the loaded or empty cars would not be switched, but simply roll by. Glued-down loads would not pose any problem. Let me now show a few additional examples of his loads. 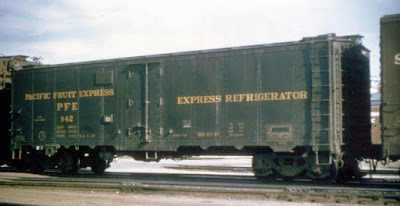 I will start with a signature Santa Fe freight car, the Caswell gondola. Richard modeled it as it was in later years, with the added top chords on the second and seventh side panels. ATSF 172307 was Class GA-7, and is an InterMountain model with added detail and a sand load, glued to a shaped piece of Styrofoam. I like this load because it shows the smoothed and slightly slumped appearance that I have seen in prototype loads of fine materials like this. 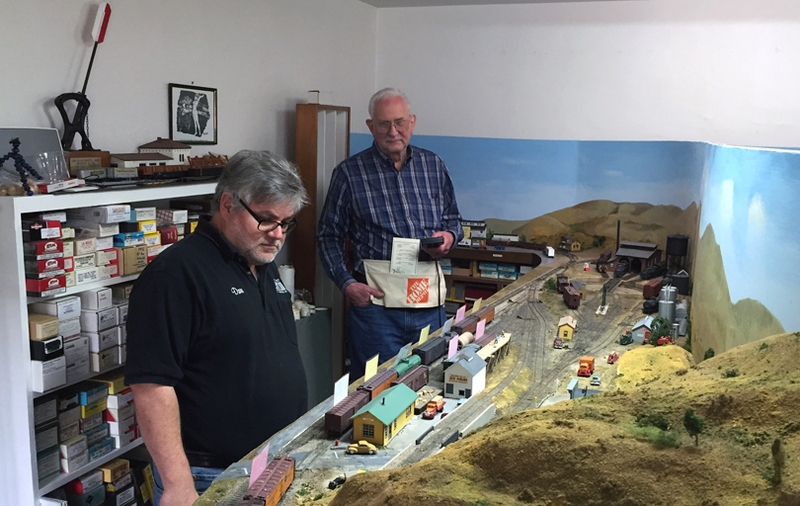 Richard enjoyed poking fun a coal-country modelers and their needs for massive fleets of hopper cars. “In the West,” he liked to say, “most railroads didn’t move that much coal, and those that did, moved it in gondolas.” He thus left the impression that he had no interest in, nor need for modeling hoppers. But being a serious freight car modeler in spite of those comments, he did build a number of models of hopper cars with coal loads. 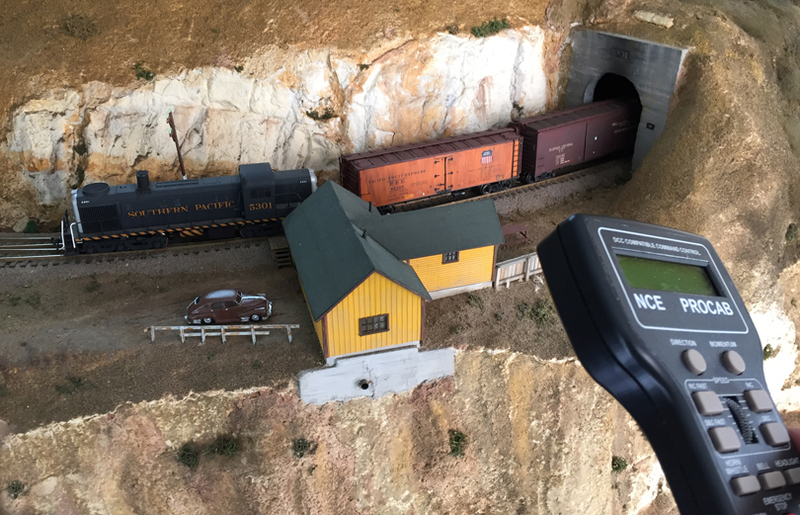 This car, MP 56037, has had wire grab irons added and other details modified from the Athearn quad hopper. 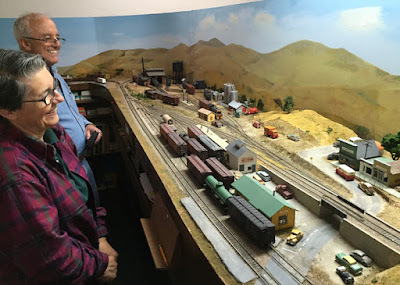 A traditional bulk load in model railroading is the scrap load, and the variety of scrap visible in such carloads can make it a very interesting load. Often modelers represent a car as entirely full of scrap, but in fact partial loads were and are common also. Here is one of Richard’s scrap loads, PRR 860017, a Class GS gondola. I believe this was built from a Westerfield kit. In addition to bulk loads like these, he did a number of loads of steel pipe, a common sight in transition-era prototype photos. I showed one of them in the first post cited at the top of the present post. Here is another, one of the cars described in Richard Hendrickson’s by-now-classic articles on modeling various mill gondolas by kitbashing the Athearn gondola. This was a two-part series in Prototype Modeler, in the September-October and November-December issues of 1982, pages 31 and 12, respectively. The car is EJ&E 32386. I was intrigued by that article, “back in the day” when we had few prototypical gondola models available, and I went ahead with a couple of the projects described in those articles (you can see my own version of the EJ&E car in an earlier post, which is at: http://modelingthesp.blogspot.com/2011/12/route-cards-5.html ). As I have spent time with the photos I took of Richard’s freight car models prior to dispersing them to many of his friends and colleagues, I continue to enjoy seeing the thought that went into them. These cars illustrate the depth of modeling which extends beyond mere multiplication of detail, to realistic representation of prototype cars. 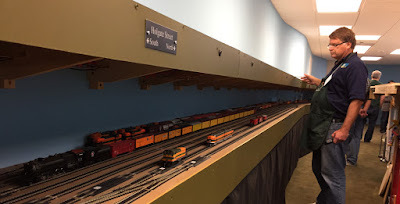 I scheduled an operating session for the just-past weekend of March 5 and 6, to bring into use several additions to the layout, to further exercise some changes in my waybill system, and of course to have some fun in the process. 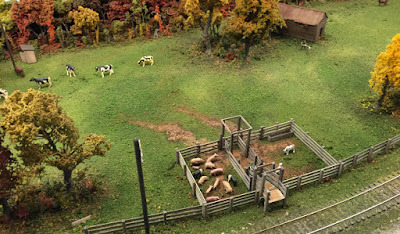 As usual, there were two two-person crews scheduled each day, to implement the work pattern that seems to work well on this small layout. Both sessions went well in terms of realizing what had been planned, though there were some stubborn turnouts that were often dead spots. I will have to redouble my efforts to fix a couple of these. But the car cycles and amounts of switching work seemed to work properly. I am always fascinated at these sessions, in my role as “source of additional information” while watching crews work, how many different ways a town can be switched. There were a couple of unusual techniques this time, too. As visible in the foreground, they had indeed kind of filled up the siding with cars, making the usual run-around (siding-plus-main) less attractive to sort out a single car. 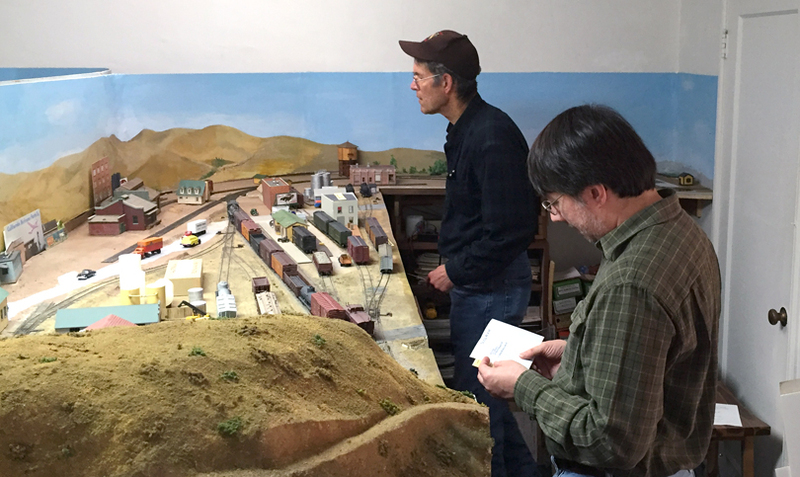 There was, naturally, equally much activity on the Ballard side of the layout, where the photo below shows the crew of John Sutkus (left) and Jeff Aley hard at work. Jeff was conductor and is deciphering waybills to see what task is next. Jeff is himself knowledgeable and experienced in waybill design, so I enjoyed letting him have a chance to switch with my versions. One of the new wrinkles I added to this pair of sessions was operation of express reefers, in accord with the ideas I described earlier about seasonality of produce shipments (see it at: http://modelingthesp.blogspot.com/2016/02/operations-seasonal-traffic.html ). It being March, the early strawberries are just coming into harvest in central California, so Guadalupe Fruit in Ballard is shipping them. Here is the mainline extra train, arriving with an REX express reefer to set out at Shumala (and with a loaded one to pick up), trailed by a mail storage car (see my description of the model project at: http://modelingthesp.blogspot.com/2014/08/modeling-sp-head-end-cars-part-7b.html ) and a 60-foot baggage car. Power is Class P-4 Pacific no. 2402 (a Westside model). Another crew on the weekend is shown below, working at Shumala, Dave Falkenburg at left and David Parks to the right. Falkenburg is the conductor here, and evidently is “having a think” about the waybills, which he has tilted up against each car. Engineer Parks waits patiently for direction. David is holding a tethered or plugged-in throttle, but one upgrade I’m looking forward to is the conversion to radio throttles. One of these days. The next time I put on sessions like these, I hope to have still more changes and improvements to the plan for each session, while continuing to refine and balance work loads for each crew in each location. The balance isn’t bad now, but can always be better. And of course all the waybills will cycle, so there will be in a sense a whole new scenario for the freight cars and trains. Looking forward to it! What is news now is that the just released March issue of MRH has Part 2 of this series. This second part addresses modeling of tank cars, not with project descriptions per se, but with descriptions of approaches, from doing little more than upgrades to commercial models, to swapping of tanks and underframes, and finally to scratchbuilding methods for both underframes and tanks. This Part 2 does not have much direct reference to Part 1, but it does refer to prototype features and details, assumimg a familiarity with the content of Part 1. Additionally, the Appendix of significant dates, omitted accidentally by the good folks at MRH from Part 1, was added at the end of Part 2. Much of the content of the column’s Part 2 has been covered in more detail in several magazine articles and blog posts of mine, though bringing all of it together in one place seemed useful to me. I did add a photo of one of Richard Hendrickson’s tank car projects, described in the August 1996 issue of RailModel Journal, as a cut-down Athearn tank to make a General American-built 10,000-gallon tank car. Mostly, Richard simply shortened the tank and underframe to the correct lengths (which was time-consuming work — but not really difficult work). Here is how that car looks today (same photo is on the MRH column). I should also mention that I made some background comments about the Part 1 column in a prior post (that post can be found at the following link: http://modelingthesp.blogspot.com/2016/02/my-column-in-february-mrh.html ), including a reminder that the entire idea of explaining and showing tank car modeling to others got its start for me in the form of a joint clinic, developed with my good friend, the late Larry Kline. 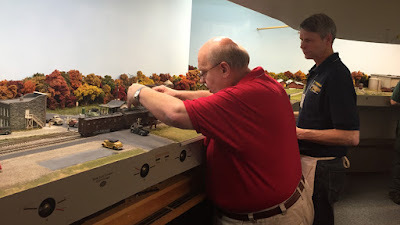 Part 2 is about tank car modeling and Larry was an excellent modeler, so I want to add some comments here about Larry’s work, even though this material was not in my column. The underframe shown at right has brass detail parts. 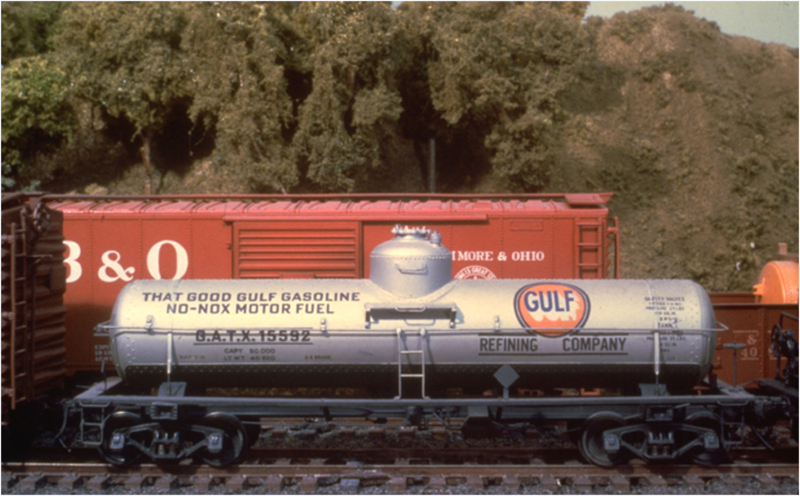 The result was a nice tank car, unlike any commercial product in O scale at the time, as you see below (Larry Kline photo). I hope this additional background for my March 2016 MRH column is of value, and may encourage those to read it, who have not already done so. My layout represents a mythical Southern Pacific branch line, diverging from the main line of the Coast Route south of Oceano, and extending out to the mouth of the Santa Maria River and the branch terminus town of Santa Rosalia.To see a map depiction of this locale, please consult my previous post on that (at: http://modelingthesp.blogspot.com/2011/01/layout-design-locale.html ). In several following posts, I have described parts of the construction of this town, for example one early stage (a post from 2014 that is at: http://modelingthesp.blogspot.com/2014/01/constructing-santa-rosalia-backdrop_29.html ), and a series of posts describing the assembly of the fine American Model Builders kit for an SP Common Standard No. 22 depot for Santa Rosalia (see Post 4 in that series, with links to prior parts, at: http://modelingthesp.blogspot.com/2015/05/sp-depot-santa-rosalia-part-4.html ). As time passed, I was able to complete my plans for how the town of Santa Rosalia would be arranged, and could then add the final piece of benchwork (the post is at: http://modelingthesp.blogspot.com/2015/07/constructing-santa-rosalia-final.html ). That plywood and Homasote piece was intended to support the full tail track at the end of the branch. Although tracklaying in Santa Rosalia had begun some time back (as described at: http://modelingthesp.blogspot.com/2015/05/flash-tracklayers-enter-santa-rosalia.html ), I was now in a position to extend the track all the way to the end of the branch. As I showed in the post just cited, a three-way switch was planned to accommodate both the siding that will provide a run-around, and also the final industrial spur in Santa Rosalia. This Peco switch is turning out to be a topic in itself, but I will defer description of that adventure to a future post. What is now completed is the last piece of main track on the branch. As shown below, this track lies right in front of the depot. The unfinished edge in the foreground is the edge of the Santa Rosalia benchwork. 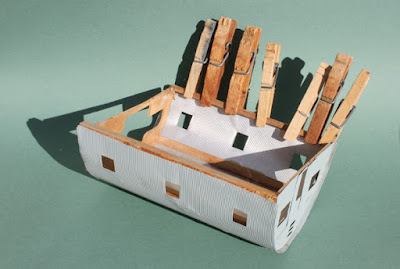 The fishing boat basin is at upper right (see:http://modelingthesp.blogspot.com/2015/06/a-fishing-boat-for-my-santa-rosalia.html ). The paper strips laid in place in the right foreground will be used as templates to cut styrene sheet for the roadway to be located there. This will be Willow Lake Road, which runs past the depot. You can also see the three-way Peco switch at left, not yet wired. At the left back of the photo above is a building flat, which is the “Ocean Shore Seafood” fish cannery, the kitbashing of which I described in a previous post (you can see it at: http://modelingthesp.blogspot.com/2015/05/kitbashing-santa-rosalia-cannery.html ). In the rather aerial perspective of the photo above, you can see that the cannery is not quite a true building flat, but does have a narrow roof segment, though that is not too evident at normal viewing height. Although I have several industrial and other secondary tracks still to install here and in others of my towns, the track shown in the photo above is the last main track to be installed on the layout. I’m far from done, but it is fun to continue to make progress. I chose to add an Apex steel-grid running board and brake step, Plano Model Products no. 197. I use canopy glue for this kind of application, because it strongly bonds dissimilar materials, and more important, remains flexible, as the metal running board expands and contracts. If not familiar with this adhesive, you may wish to read my extended comments on it (see: http://modelingthesp.blogspot.com/2013/05/a-few-words-in-praise-of-canopy-glue.html ). After application, I painted the step and running board Tru-Color no. TCP-135, SP Dark Olive Green. This brings up the subject of roof color. The roof provided in the kit is painted the same color as the car body. There is evidence that at least the first few cars converted for express service did have Dark Olive Green roofs. However, photos of later cars in the number series (PFE 901–950) seem to show a darker roof color, likely black as was used on passenger cars. Since the car number of my kit is PFE 909, I decided to model it with the green roof. 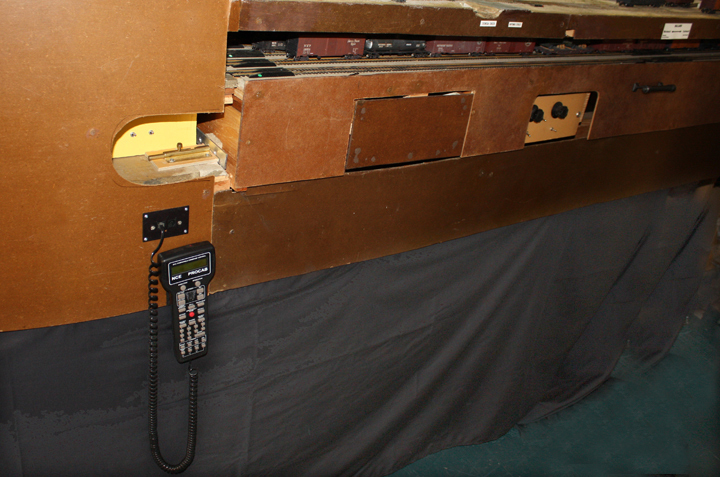 I also have a stand-in model of PFE 928, and it has a Grimy Black roof. While on the topic of paint, a color photo may be of interest. As stated in the prior post, the body color of these cars was SP and UP Dark Olive Green, and lettering is Dulux Gold. This photo of PFE 942 is from the E.H. Mohr collection, but as it is in the form of an old print, the color rendition may be questionable. Lettering arrangement is well depicted, though. 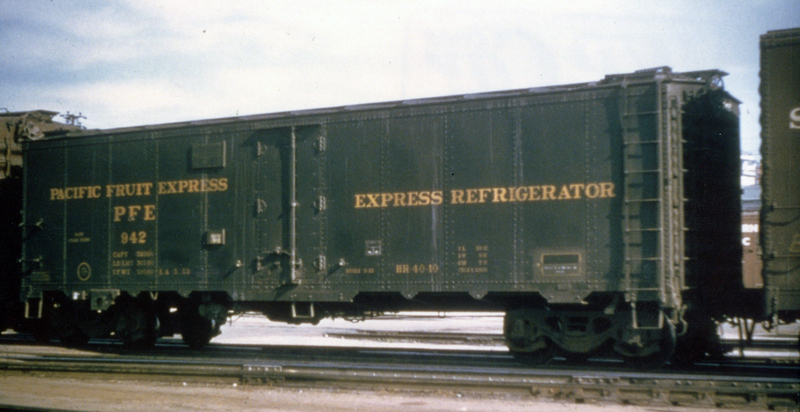 Note that as was typical of the later cars in the series, a painted yellow circle was used instead of a dummy fan plate over the left truck. You can also see the Symington-Gould Type XL trucks fairly well here; these were applied to cars PFE 926–950. My last comment on the InterMountain kit, now that it’s complete, is that I have some reservations about the color IM painted this model. It matches neither Pullman Green nor a color drift panel for SP Dark Olive Green, and is definitely lacking in brown relative to either of those colors. I will have to weather the car lightly, since it would have been relatively recently converted and painted for my 1953 modeling time, but I hope to obscure the paint color shortcomings. 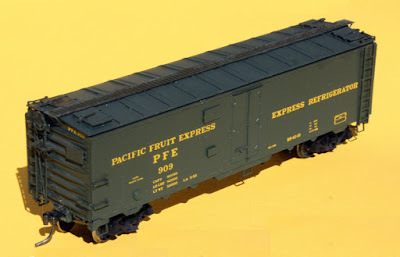 The completed car, shown above, meets the operating needs I have for one of these 40-foot express reefers. Thanks again to Ross Dando for the superb castings that made possible the Chrysler truck representation. But as mentioned, the car still needs to receive some weathering before entering service.